"You don't have to identify yourself to a woman wearing a mask!" The group is rescued again by the Nautilus, although this time Grandis and her gang, Sanson and Hanson, are along for the ride as well. They all become apprentice crew members on the Nautilus, and Grandis becomes infatuated with Captain Nemo. First mate Electra displays a certain amount of jealousy over this. Jean and Hanson are fascinated by the ship and try to learn all they can. When they spot the Gargoyle's ship, they make chase, but soon find themselves in a trap they cannot escape. The story reverts to the silliness of the first volume in great measure. Poor Nadia finds herself shunted far into the background in these four episodes, with Grandis and Nemo taking center stage. These episodes really have a feeling of sheer padding. The trap laid by the Gargoyle is good for one episode, but the other three seem quite aimless and nothing more than filler. However, the disc does end with a powerful cliffhanger that will make it hard to wait for the next disc to be issued. As is par for this series, the animation is quite good, with attractive visuals throughout. Quite a bit of superdistortion is utilized, for those who like that. There's plenty of comedy relief, but really precious little tension in most of the episodes. The humor mostly falls flat, but a few slapstick sequences may amuse less discriminating viewers. The brief sequence where the sound of Nemo's organ playing fills the submarine is well executed and atmospheric. The English dub is pleasing in general, though obviously the Japanese track is to be preferred. 13-year-old Meg Bauman does an outstanding job voicing Nadia, capturing much of the original's inflection and character. The supporting voices are less happily cast. Jean continues to have an annoyingly fake French accent, and Marie, who looks to be three or four-years-old, sounds like an adult. 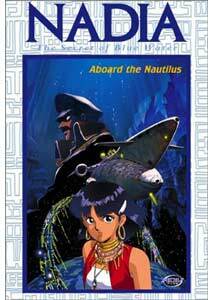 Captain Nemo is much less powerful sounding in the English dub than the Japanese version. The character design is interesting, with Nemo and Electra delineated in fairly realistic manner, in contrast to Grandis and her gang. Nadia is almost embarrassingly sexual, in an obvious ploy to appeal to the fetishes of Japanese businessmen for adolescent girls. After four episodes of this program, I feel a little sleazy myself. Image Transfer Review: The picture is quite good overall, and displays a clear improvement over volume 2. Colors are much more stable, and far less damage is visible. The dual-layer presentation certainly helps, for bitrates run consistently quite high. Audio Transfer Review: Both the English and Japanese tracks are presented in 2.0. There is occasional quiet surround activity (almost entirely background music), but the program is very center-oriented. The audio is free of hiss and noise, and dialogue is clear throughout. The music has excellent range and there is good bass extension. The audio is quite pleasing indeed. Extras Review: The extras are again scant. We do get the same textless opening and ending sequences that appeared on volumes 1 and 2, as well as a brief and slightly spoilerish preview of volume 4. The same two television spots for the series (with English voiceover only) are included. Wrapping up the package are brief and generally cryptic previews of Soul Hunter, Princess 9, Robotech, ShadowRaiders, Original Dirty Pair and Dai Guard. Again, nothing to get excited about. A disappointing volume of four filler episodes that don't move the story forward visibly. The transfer is very good, as usual. Again, little for extras.